I have so much to be thankful for this year...a healthy, loving family, fabulous friends, a warm and cozy home, a new teaching job that I love...MY blessings are truly endless. Sometimes it's so easy to get caught up in the "wish I had this" and "only if I had that" and it's nice to have the reminder to stop and just be thankful for everything we do have. My thoughts are with all my neighbors who have recently lost everything from Hurricane Sandy, those who are serving in our military overseas and cannot be home with their family, and those who are dealing with illness, other losses and/or devastation. 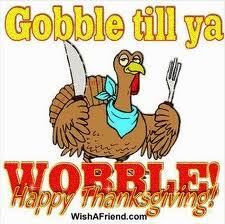 May everybody enjoy their day, however you are spending it, and find something to be thankful for on this day.